Anne Hillerman is back with her second novel as she builds on her father’s beloved Leaphorn and Chee mystery series. ROCK WITH WINGS. By Anne Hillerman. Harper. 322 pages. $27.99. When both husband and wife work for the Navajo Tribal Police, quality time together can be at a premium. So Sgt. Jim Chee and his wife, Officer Bernie Manuelito, are excited about the prospect of a brief vacation together, even if it’s a working vacation of sorts. Chee’s cousin and clan brother, Paul, is starting a new business, a guest hogan in Mystery Valley, just outside the Monument Valley Navajo Tribal Park. He plans to drive guests to good locations for getting photos of the spectacular sandstone formations in the park, which stretches from Arizona into Utah. Paul has invited the couple to try out his guest hogan, but Chee and Bernie rightly figure he’s also going to need their help getting things ready. But life and duty interfere, as they so often do. They have to hurry home because Bernie’s younger sister, who was supposed to be taking care of their elderly mother, has disappeared. Once back home, Bernie gets embroiled in some tricky cases, including a suspicious fire. She’s also interested in some people who are working to develop solar energy on Navajo land. Chee, meanwhile, goes back to help his cousin, but soon gets called in to help the local police in the area. A woman has gone missing from a movie set, and in the process of looking for her, Chee finds what looks like a grave where none should be. As Chee and Bernie work on their separate investigations, both uncover more than they had bargained for. Danger lurks in unexpected places. Retired Lt. Joe Leaphorn, still recovering a nearly fatal shooting, manages to give them some help. 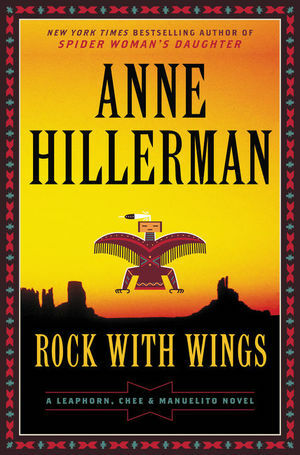 This is the second mystery novel in which Anne Hillerman has taken up the stories of the popular Navajo tribal police characters created by her late father, Tony Hillerman. In addition to keeping the beloved Leaphorn and Chee going admirably, she adds a feminine touch by telling a good portion of the story from Bernie’s perspective. Tony Hillerman fans could debate endlessly whether the daughter’s new books are as good as the father’s. I’d have to go back and re-read some of Tony Hillerman’s earlier books to make a thorough comparison. I haven’t been tempted to do that, however, because Anne Hillerman’s books are good enough. Perhaps most important, like her father, she writes with understanding and respect about the Navajo people, their traditions and the beautiful, dry, wild land they call home. She also writes well, and, also like her father, she incorporates contemporary problems and realities into her stories, showing how the Navajo people reconcile their ancient ways with today’s world. The mystery she weaves is lively, the denouement believable. I’m glad she had the courage to follow in her father’s footprints through the sands and rocks of the Four Corners area. I look forward to her next Leaphorn, Chee and Manuelito novel. This entry was posted in Detective fiction, Mysteries and tagged Anne Hillerman, Leaphorn and Chee, Navajo nation, Southwestern ficiton. Bookmark the permalink.